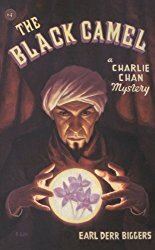 Charlie Chan appeared in only six novels by Earl Derr Biggers. When Biggers wrote the first novel, it was an instant hit. The other books maintained the popularity that the first achieved. The character became immensely popular and inspired more than forty-five films about him. But it wasn't always so. In an era when many Americans were ethnocentric, understanding of cultures and sensitivity were lacking. The unknown sometimes inspires fear or discomfort, and the imagination can easily come into play. When creating plots for fiction, or characters, writers often relied much on the imagination and little on research or real knowledge. Earl Derr Biggers had already been exposed to the literary archetype of "the sinister Oriental" or, even worse, "the Yellow peril." (Today, these phrases are offensive; during the time, ethnocentrically-centered people were unaware of the offensive nature of these ideas.) The Fu Manchu character created by Sax Rohmer was first presented to the public in the novel The Insidious Dr. Fu Manchu in 1913, which was followed by a number of other books about the character. But then Biggers came across an article in a newspaper about a detective in Hololulu named Chang Apana. 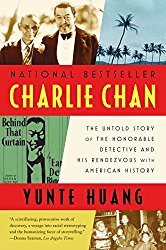 Thinking in terms of plot construction and characters, and not in terms of cultural reality, he reasoned, "Sinister and wicked Chinese are old stuff...but an amiable Chinese on the side of law and order had never been used." 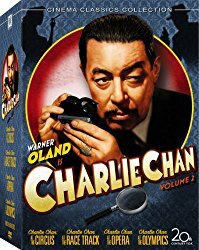 That was the germination of an idea that began his developing Charlie Chan. "We'll see what Charlie has dug up out here," he [Captain Hallet] said, and led the way to the lanai. The huge Chinese man knelt, a grotesque figure, by a table. He rose laboriously as they entered. "Find the knife, Charlie?" the captain asked. Chan shook his head. "No knife are present in neighborhood of crime," he announced. "On that table," Miss Minerva began, "there was a Malay kris, used as a paper cutter--"
The Chinese man nodded, and lifted the kris from the desk. "Same remains here still," he said, "untouched, unsullied. Person who killed carried individual weapon." "How about finger-prints?" asked Hallet. 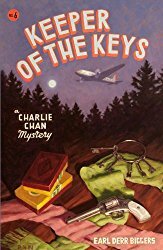 "Considering from recent discovery," Chan replied, "search for finger-prints are hopeless one." He held out a pudgy hand, in the palm of which lay a small pearl button. "Torn from kid's glove," he elucidated. "Aged trick of criminal mind. No finger-prints." "Is that all you've got?" asked his chief. "Most sincere endeavors," said Chan, "have revealed not much. However, I might mention this." He took up a leather-bound book from the table. "Here are written names of visitors who have enjoyed hospitality of the house. A guest book is, I believe, the term. You will find that one of the earlier pages has been ruthlessly torn out. When I make discovery the volume are lying open at that locality." Captain Hallet took the book in his thin hand. "All right, Charlie," he said. "This is your case." And later in the book another passage shows his relationship with Captain Hallet. Chan laid a deferential hand on his chief's arm. "Humbly suggest I attempt this," he said. Hallet nodded. "All right, he's your meat, Charlie." He drew back. Chan bowed with a great show of politeness. He launched into a long story in Chinese. Lau Ho looked at him with slight interest. Presently he squeaked a brief reply. Chan resumed his flow of talk. Occasionally he paused, and Lau Ho spoke. In a few moments Chan turned beaming. "Story are now completely extracted like aching tooth," he said. "Wristwatch was brought to Lau Ho on Thursday, same week as murder. Offered him on sale by young man darkly colored with small knife scar marring cheek. Lau Ho buy and repair watch, interior works being in injured state. Saturday morning he sell at seemly profit to Japanese, presumably this Okoda here but Lau Ho will not swear. Saturday night dark young man appear much overwhelmed with excitement and demand watch again, please. Lau Ho say it is sold to Japanese. Which Japanese? Lau Ho is not aware of name, and can not describe, all Japanese faces being uninteresting outlook for him. Dark young man curse and fly. Appear frequently demanding any news, but Lau Ho is unable to oblige. Such are story of this jewel merchant here." Note: To read more about The House Without a Key (novel), click here. 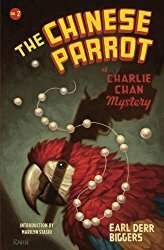 Since the books were successful, Chan was a likely candidate to appear in films. But Hollywood was not sure how this "amiable Chinese on the side of law and order" would be accepted by audiences (again an ethnocentric judgment!). Afraid to give him a large role in early films, Behind That Curtain had a very brief appearance in the early part of the film and a slightly longer appearance near the end of the film. (Note: Behind That Curtain was the third film; the first two are lost so I cannot comment on them.) Other than the detective's minor appearance, the film was faithful to the book. Korean actor E. L. Park played Chan; Boris Karloff appeared in the film, as well. 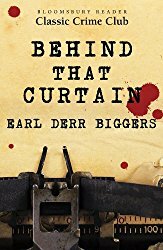 Then Earl Derr Biggers was called upon to create a script. He wrote the screenplay for The Black Camel and expanded Chan's appearance in the film. 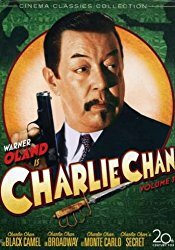 Swedish actor Warner Oland played the detective and the rest is history. 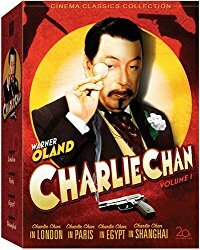 The character was extremely popular, and Oland went on to appear as Chan in many more films. 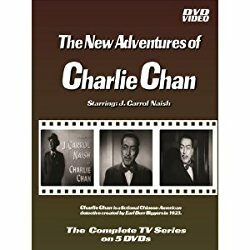 Keye Luke made his first appearance in Charlie Chan in Paris, as Charlie's "Number One Son." (Charlie had a large family.) Luke was so well received in the role that he continued in many more films. 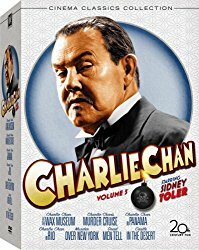 When Warner Oland died of pneumonia Sidney Toler took over the role. Toler appeared in many more films. During his career, the property went from the more lavish 20th-Century Fox studios to the lower-budget Monogram studios. But the character maintained his popularity. When "Number One Son" Keye Luke left the series, Victor Sen appeared as the "Number Two Son," and also achieved popularity. When Keye Luke, who was Chinese, was asked later in his career if he were offended by the idea of a Chinese detective being played by a succession of Caucasian actors, he basically said, "We weren't conscious of any problem at the time. We were just actors looking for a part. We just wanted to be working actors" [ paraphrased because I read this years ago and don't have the exact quote at hand]. When Sidney Toler died, Roland Winter took up the mantle. 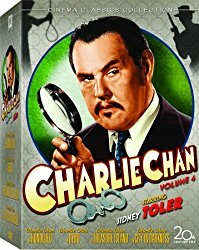 Occasionally Chan was to appear in other individual films, made-for-television films, television series, an animated series, and comics. 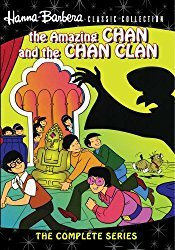 J. Carroll Naish (on television), Peter Ustinov (in film), and Keye Luke (whose voice was used in the animated series) played Chan. 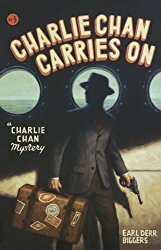 Charlie Chan Returns (1974) by Dennis Lynds, a novelization of the TV film. Charlie Chan and the Curse of the Dragon Queen (1981) by Michael Avallone, a novelization of the film. 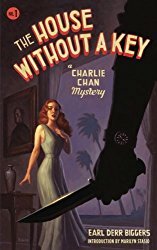 Charlie Chan in the Pawns of Death by Bill Pronzini. Charlie Chan in The Temple of the Golden Horde by Michael Collins . The House Without a Key (1926) lost (featuring George Kuwa as Chan). The Chinese Parrot (1927) lost (with Japanese actor Sojin). Behind That Curtain (1929) (E. L. Park appeared in two brief scenes as the great detective; Boris Karloff also appeared in this film). Walter Connolly and, later, Ed Begley played the great detective on radio.